Having the right beauty tools can make all the difference in the finished look of your makeup. I’ve been using the same combination of brushes for years, only adding new pieces when something amazing comes across my radar or when a daily favorite wears out. 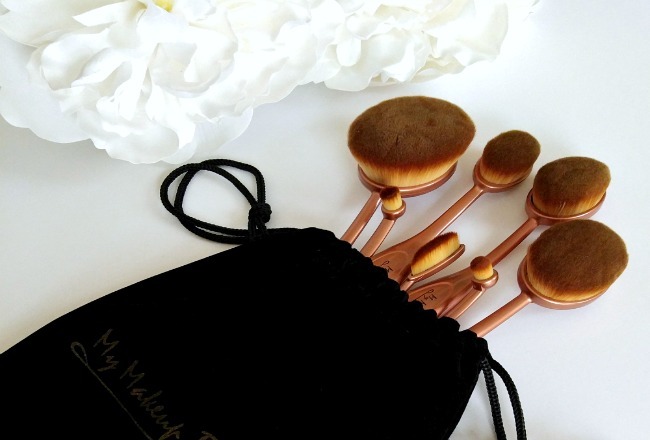 Quality makeup brushes are a must-have for several reasons. First, it takes a lot of skill to overcome crappy brushes and though I would rate my application skills as better than average, I don’t want to spend extra time making up for inferior brushes. Second, when you buy quality brushes, they last for years. I’ve had most of my makeup brushes for well over a decade. I’ve been eyeing the Artis makeup brushes on YouTube and decided to try the oval brushes from My Makeup Brush Set first to see if I would like using the new style of brushes. Why? The full set of the Artis brushes would require me to get a third job whereas the collections available from My Makeup Brush Set appear to be quite similar and are far less expensive. Let the experiments begin! The synthetic brushes in the My Makeup Brush Set are super soft, versatile and blend like a dream. Each brush has multiple uses and within the framework, you need to decide which brush size works best for the contours of your face. The Handle A brush was a little too big for my taste so I used the B Handle to apply my foundation. It worked beautifully. 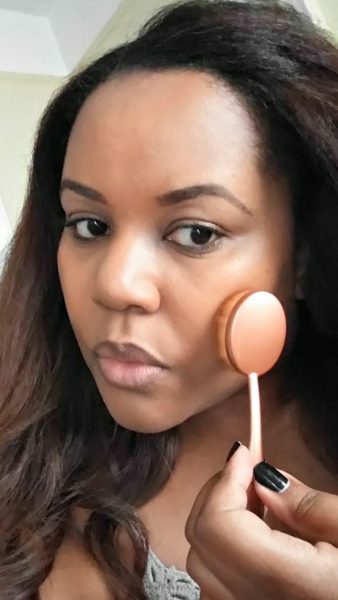 Before trying it, I was deeply concerned about the brush drinking a lot of my liquid foundation but it didn’t absorb much foundation at all. 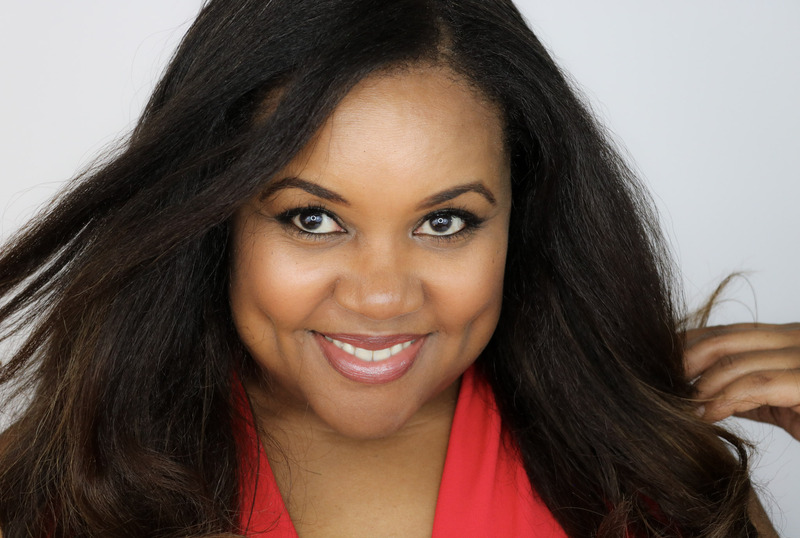 Instead I got a smooth, airbrushed look in seconds! Far less time than it takes to get the same results using a Beautyblender. The Beautyblender is great but my wrists hurt from all that pressing and rolling. Pass. I also really liked the C & D Handles for cheek and face contouring. These two fit the contours of my face nicely and made short work of contouring which can be a tricky proposition. The overall beauty of these brushes is that they are both concise and cover a lot of surface quickly. And they blend while applying product so you can get the job done in much less time. I tried using the smaller I Handle for concealer but didn’t like the scratchy feel of it. I’m not sure if the brush I received had a slight defect but it was not pleasant. 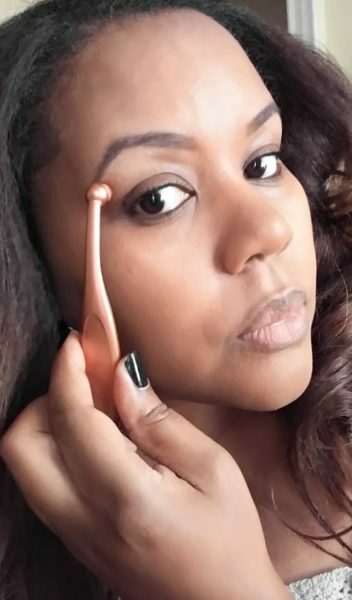 I did like the J Handle for applying highlighter on my brow bone and nose. I haven’t tried the eyeliner brushes yet, Handles F & H, mainly because I’m a die-hard eyeliner pencil girl. Pots of eyeliner intimidate me. I know, don’t make fun! 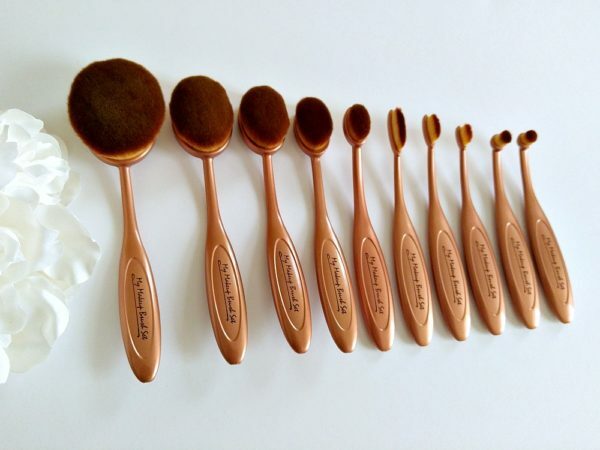 I have added a few of the oval brushes from My Makeup Brush Set to my daily arsenal. The Handle B for foundation, Handles C & D for cheek and face contouring and Handle J for highlighting small areas. The Handle E can be used for eyeshadow washes but was a little cumbersome for me so I’ll likely stick with my traditional brushes to create the eye looks that I want. 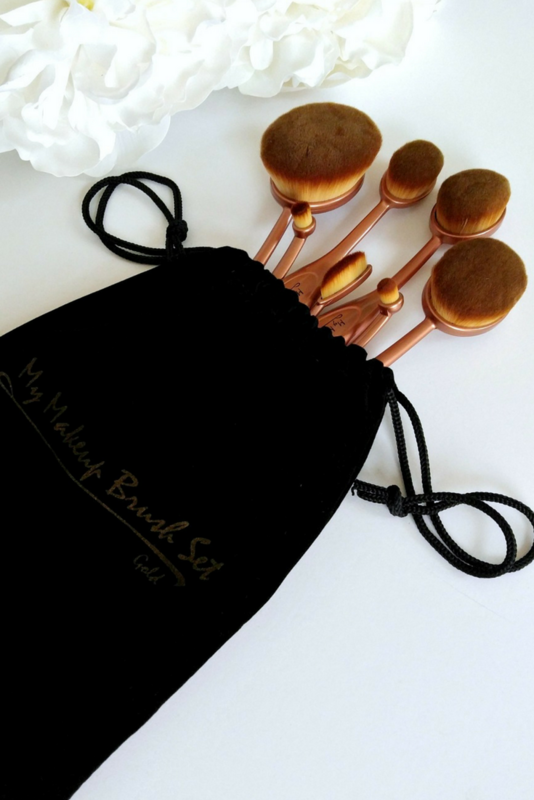 I really liked the smooth, flawless finish I achieved with these brushes and they feel luxurious on my skin which is a major plus. I always have fun with makeup but working with these super soft brushes felt like an extra treat. Finished look minus a lip treatment. 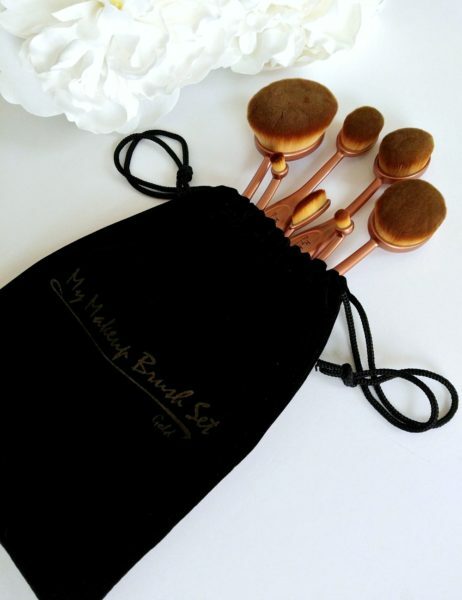 In addition to the set that I have, MyMakeupBrushSet.com has oval collections in a variety of finishes. I really like the look of the Black and Gold set (currently on sale for $39.99) as well as the 5-piece Rose Gold Set currently available for $15. Gorgeous and a bargain! Plus, for a limited time, you can get 20% off your purchase with the code 20OFFSUMMER. 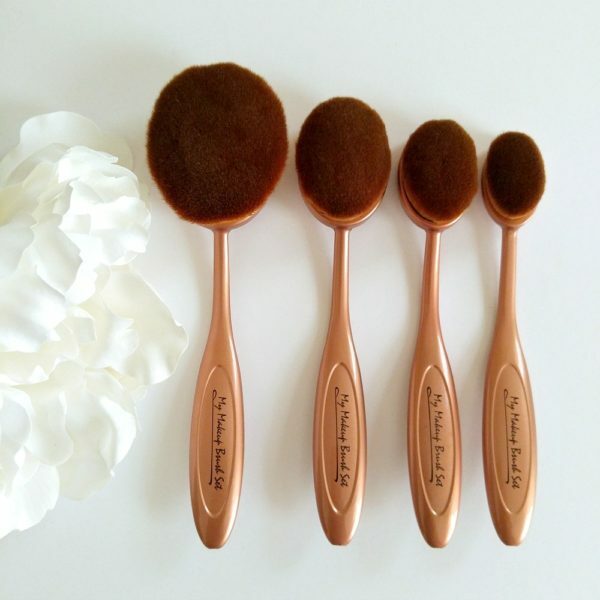 Have you joined the oval makeup brush craze yet? I’d love to know what you think and what results you’ve gotten with them. Drop a comment below and share the good word! Thanks for reading and as always, stay saucy! I received a complimentary set of brushes from My Makeup Brush Set. All opinions are my own. For more info on The Patranila Project’s policies, please visit this page. I’ve never heard of this type of makeup brushes! Your makeup looks amazing so I need to look into them! I have never seen brushes like that!! They do look really soft. Your make up looks flawless so you’re doing something right!! The brushes do look a little awkward for eye make up, but to each their own!! Those brushes are really unique! I’m always looking for new ones so I guess I need to check these ones out. I think I’m SO used to holding a traditional brush that there’s no way I’d be efficient at the oval style brush. 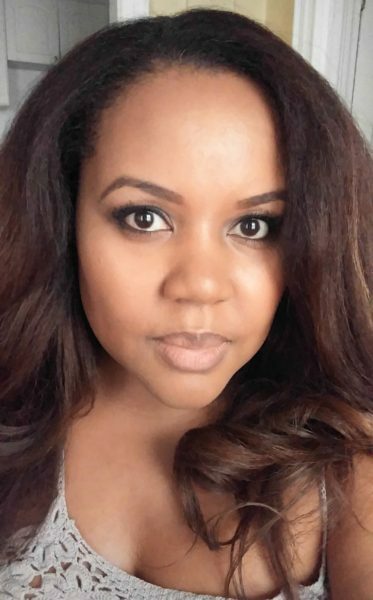 I’m at the point in my life as a late-20-something where I FINALLY have a makeup routine that WORKS for me and I’m not anxious to feel like I’m starting over! It wouldn’t be starting over at all Rachel. It’s making an addition. Try one, you might like it! Those brushes are really gorgeous. I love when practical things can be displayed and left out in your home. Yes! I’m all for form and function! I feel like I just got an amazing crash course on these make up brushes! Haha – I’m the kinda girl who just YouTubes make up videos (because of my obvious lack of expertise on the subject) so I’m really glad you put together such a detailed post on these brushes! I’m so glad this was useful for you Shem! I had seen people using the larger brushes but never the smaller ones and I couldn’t figure out how to use them effectively and figured there must be someone else who wanted to know too. Thanks for stopping by!